"Media Tools" is a browser extension (add-on) to detect all media (video, audio and image) sources by monitoring network activities. In oppose to the other similar extensions, Media Tools has zero impact on your browser performance when the grabber window is closed. To grab a media, open the Media Tools window and refresh the browser tab that has the intended resource and wait for the resource to be fetched by browser one more time. You can use filters to declutter resources area and you can bulk download resources by selecting multiple items at once. What is "Media Tools" extension and how does it work? Media Tools is a cross browser add-on to detect media resources from web pages. It monitors network requests and displays all the media resources that is requested by loading tabs. 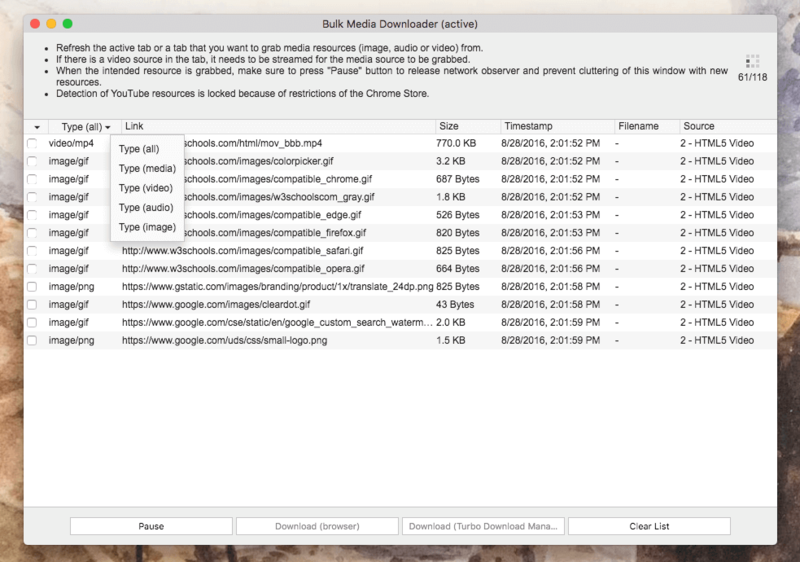 Media tools resolves file-names, file-sizes and requests origins when a resource is appended to the grabber window. You can filter different type of resources to prevent cluttering of the window. It is possible to select multiple files at once and ask the extension to batch/bulk download them as well. Note that the extension does not monitor the network when the window is closed to have no impact on your browser performance. Whenever, a media needs to be grabbed, open the detector window by pressing the toolbar button. When the network monitoring is enabled, there will be a badge on the toolbar button. When your intended resource is appeared in the window, you can press the "Pause" button to ask the extension to stop monitoring the network. Now select one or more items and then press on of the "Download" button in the tools section of the window. Too many resources are being shown on the window when I want to grab a video file. Is it possible to filter out other resource types? Yes, press the "Type (all)" element in the header's section and select "Type (video)". This option will hide all other resource types from being shown in the grabber window. When I am on a picture gallery website, too many pictures are being shown in the window. Is it possible to select all of them at once? Yes, click on the selection box in the header area, and choose "Select all images" option. What is the "R" badge notification? When the grabber window is closed, the extension removes all the network services to have zero impact on your browser performance. When the grabber window is opened, you will see a "R" appears in the badge area of the toolbar button, meaning the extension is recording network activities. To have no effect on your browser performance, it is recommended to press the "Pause" button or close the grabber window when an intended resource has been appeared in the window. What sort of information is shown in the grabber window? Resource type, url, timestamp of the activity, resource file-size, and the parent tab title is shown in the grabber window. Is it possible for Media Tools to send download requests to a download manager? At this moment you have two options for handling your downloading jobs. One is the default browser download manager and the other one is "Turbo Download Manager". Note that since Turbo Download Manager has an advanced filename detection as well as it can handle referrers, it is recommended to send download jobs to this download manager. Sending download jobs to the "Turbo Download Manager" extension will be available on Firefox browser soon.